In addition to thousands of parts and accessories for automatic gates, garage doors and garage door openers, North Shore Commercial Door carries a full line of repair and replacement parts for truck doors from Todco and Whiting. 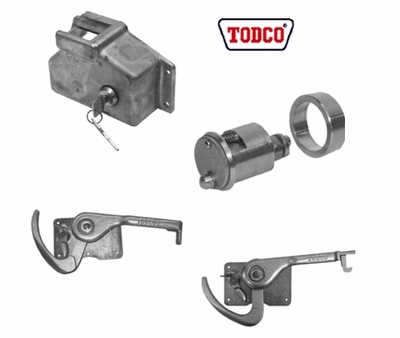 We have hinges, rollers and other fixtures for repairing roll-up truck doors, and lock assemblies for adding security. We also stock counterbalancing parts such as cable drums for both right and left side use and for multiple door sizes, cable assemblies, spring plugs and counterbalance torsion springs. We even carry food grade lubricant for smoothing door operation. If you have questions about any of the parts we sell, don't hesitate to contact us. We are not just a warehouse selling parts. We're a family-owned business with 35 years of experience in the field and we have the expertise to help you determine what you need. Call us at (440) 365-5707 between 8 a.m. and 4:30 p.m. Eastern Time weekdays or contact us online, any time day or night, for personal assistance, low prices and fast shipping.